The country's sport governing body was left in the dark as the FAI manoeuvred a new role with a six-figure salary for its outgoing chief executive John Delaney. The FAI cited a review into its governance structures as a reason for John Delaney stepping aside as CEO, and appointing him as an executive vice president. Last night, Sport Ireland - which oversees public funding - said it did not know such a review had taken place, and the first it heard of Mr Delaney stepping away from his role was on Saturday night when it was announced by the organisation after the Republic of Ireland beat Gibraltar 1-0 away. "Sport Ireland was not consulted in the commissioning of the report into the structures in the FAI," a spokesperson told the Irish Independent. "Generally, national governing bodies conducting a review in the area of governance would choose to consult with Sport Ireland as part of this process. Sport Ireland was informed on Saturday [about Delaney's departure]." The FAI stood by its decision not to engage with Sport Ireland on the review before Mr Delaney's departure, saying the report was done on an "internal basis". The Irish Independent understands that Mr Delaney will earn somewhere in the region of €120,000. However, the association has refused to give details of his new payment entitlements and any possible perks that come with the newly created role. It would only say he has taken a "substantial reduction" on the €360,000 he has been receiving as chief executive of the organisation. A source told the Irish Independent that Mr Delaney will not return to his prior position in the future. 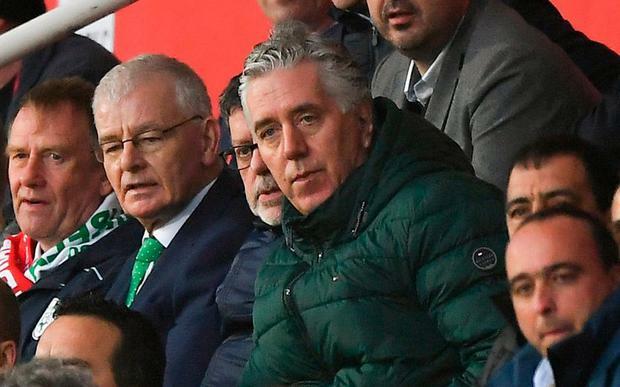 The news came a week after it emerged the former FAI CEO had paid €100,000 to the association in the form of a bridging loan back in 2017. The FAI is claiming that Mr Delaney stepping aside from his role was not related to this, but was a consequence of the governance review that was commissioned in February. The review was undertaken by sports governance expert Jonathan Hall, who is a former director of governance and director of football services with the English FA. Yesterday, the FAI said Mr Delaney will still lead a delegation from the organisation to appear before an Oireachtas committee next month. FAI chief operating officer Rea Walshe has been appointed interim CEO. The FAI says it hopes to have a permanent CEO in place by the time of its AGM next July. It's understood an external recruitment agency will be engaged by the organisation to lead the process of finding a new chief executive. Advertisements for the job will be published as early as next week, with interviews expected to take place in late April or early May. However, it's understood the new chief executive will not be earning the €360,000 salary Mr Delaney was receiving in the role. Ms Walshe is among three people seen as favourite to get the role of CEO. The other two are former Cork City and Shamrock Rovers goalkeeper Noel Mooney, and former Ireland international Niall Quinn. Mr Delaney's new role will include responsibility for all "Fifa and Uefa matters including membership of the Uefa Executive Committee; all FAI tournament bidding projects; international relations and support; the John Giles Foundation; membership of the board of the Aviva Stadium; planning for the centenary of the FAI and the 50th anniversary of women's football in Ireland in 2023; and a bid to host the Uefa Women's Champions League final in Dublin". There is currently no question of any Sport Ireland funding being held back from the FAI as a result of the controversy. Sources said taxpayers' money given to the organisation is ring-fenced for specific projects and there are "no concerns" in this area. Sport Ireland is expected to be brought before the Oireachtas committee in advance of the FAI delegation. Sports Minister Shane Ross has declined to comment on Mr Delaney's move into a new role.